(CNN) - Although Rick Perry avoided taking any digs at his GOP opponents during remarks in Ames Sunday afternoon, reporters caught up with the Texas governor on his way out of a crowded coffee shop and goaded him into a few jabs at Mitt Romney. When asked about Romney’s suggestion at Saturday night’s debate that the two bet $10,000 over whether or not there was a passage removed from Romney’s book pertaining to health care mandates, Perry said the proposal shows the top-tier candidate is out of touch with average voters. The comments were similar to those Perry made earlier in the day when he said he was “a little taken aback” by the wager suggestion from the former Massachusetts governor. Team Romney defended the proposed bet after the debate Saturday, saying the high number was intended to prove how strongly Romney felt about the issue. While Perry has found himself the subject of much post-debate criticism this election cycle, Romney has thus far emerged relatively unscathed from nearly every debate. 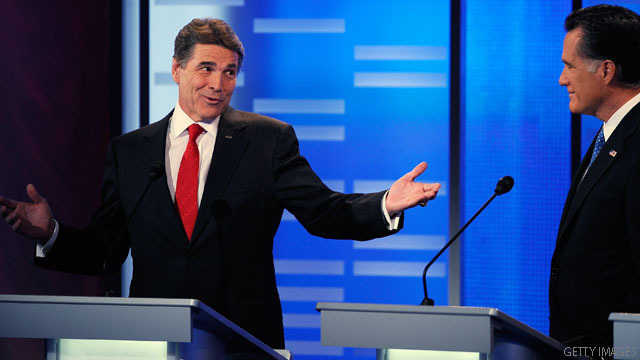 After wading gently into the issue of Romney’s proposed bet, Perry offered his opponent an out. “Maybe it was just a big mistake,” Perry said. Perhaps a $10,000 bet between politicians over who said what when is, in the words of Governor Perry, "all a big mistake." For once, the man may be right. Perry is always a "day late" and a "few" French Fries short in a Happy Meal!!! Obama 2012 – because if you stick with President Obama,, you are sure to get a "complete meal." Perry's a moron. Mitt was making a point with the betting rhetoric, which is, you're lying Rick. Stop bringing up phoney facts in these debates. Hell – I don't think Ricky can count to 10,000 without help from his advisors. Romney is the best candidate folks. Let's get this primary over with so we can excuse Obama without any further delay. The size of the bet is something that is extrodinary for most Americans couldn't do. I think that if the bet had been smaller, like $10 or what ever is in your wallet, I would have felt that is good enough. Not a good idea to make fun of the monkeys at the zoo, Ricky. They might throw poo at you.